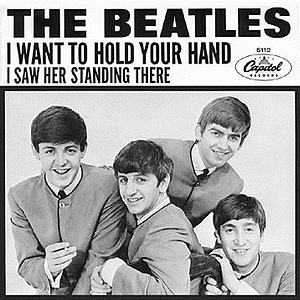 And now, a recurring segment where we take an oral history look at famous things - we look at the Beatles "I Want to Hold Your Hand"
Arthur Ken, a potential Beatles manager: So I had heard of this band coming from Liverpool, right? And they were The Beetles, and I was like, that’s crazy. We had to show off these four guys. We had to go outside, and I announced, ‘Listen people, these are the beetles’, and the 4 guys stood there. But there weren’t any beetles, so we had to wait a few days out there for any beetles to show up. But there weren’t any beetles, and the people were getting very impatient, and they kept saying to me that it was a joke. So I never really saw them again after that. I didn’t hear much about The Beatles, really, because after that I was in a plane crash and I was lost for 20 years on an island with a lot of mysterious caves. I saw many things in the caves. I might have visited hell, I don’t know. It certainly was hell for me. Henry Milligan, The Beatles' assistant to the assistant engineer: Oh man, I remember the day The Beatles came into my recording studio, and they said they that wanted to write a song about wanting to hold your hand, and I was like, ‘That’s real revolutionary. I didn’t even know you could hold another person’s hand.’ You gotta remember the culture at the time in England was that nobody really talked about things like holding hands. We didn’t even know where the children came from. You would wake up one day and you would find another baby in the house because your parents had had a dream about the Royal Family. It gave rise to the simple phrase of ‘royally’, where couples who really wanted a baby would spend each and every night focusing hard on the Royal Family, or thinking about them, or what they’re doing. It was a big deal at the time. One of the hit English films was about that. So you could really understand that when the first song from The Beatles was saying that not only is holding hands of another person possible, but it was in many ways desirable, it was one of the biggest things we had ever heard about. That was truly the start of what they eventually called ‘greatly appreciating the rock and roll music of the band The Beatles’. Of course, Americans mostly simplified it and called it ‘Beatlemania’, which was not what we called it here. I remember that one time that I was talking to Paul about royally and I never forgot this. He said, "Who are you?"